Matthew Baugh: The Way of the Crane starring Madame Atomos, Kato. Michelle Bigot: The Tarot of the Shadowmen -- art portfolio depicting various heroes and villains as the Major Arcana of the Tarot. Christopher Paul Carey & Win Scott Eckert: Iron and Bronze starring Doc Ardan, Hareton Ironcastle, Antinéa. G.L. Gick: Tros Must Be Crazy! starring Tros of Samothrace, Astérix. Micah Harris: May the Ground Not Consume Thee... starring Lord Ruthven, the Count of Monte-Cristo. Tom Kane: The Knave of Diamonds starring Francisco Scaramanga, O.
Lovern Kindzierski: Perils Over Paris starring Fascinax, Irma Vep. Rick Lai: All Predators Great and Small starring starring Josephine Balsamo, the Black Coats, the Vampires, Dracula. Roman Leary: The Heart of a Man starring the Nyctalope, Ernst Stavro Blofeld, Giraud. Jean-Marc Lofficier: Madame Atomos' Holidays starring Madame Atomos, the Yellow Shadow. Randy Lofficier: The English Gentleman's Ball starring the Phantom Angel, Belphégor, Bertie Wooster. Xavier Mauméjean: The Most Exciting Game starring Count Zaroff, John Markham, The Serpent Men. Jess Nevins: A Root That Beareth Gall and Worms starring Monsieur Lecoq, Dr. Loveless, Alejandro de la Vega. John Peel: The Dynamics of an Asteroid starring Dr. Omega, Professor Moriarty, Zephyrin Xirdal. Frank Schildiner: The Smoking Mirror starring Jean Kariven, Inspector Cramer. Stuart Shiffman: The Milkman Cometh starring Tevye the Milkman, Rouletabille, Sherlock Holmes, Ivan Dragomiloff. David L. Vineyard: The Jade Buddha starring Arsene Lupin, Hanoi Shan, Henri de Beaujolais. 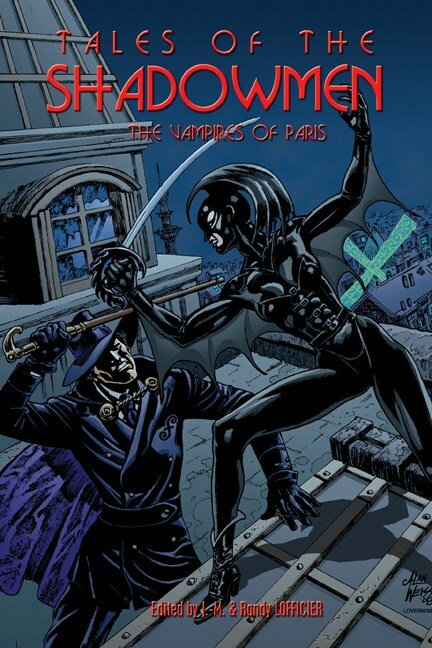 Brian Stableford: The Vampire in Paris (Part IV of The Empire of the Necromancers) starring Gregory Temple, Malo de Treguern, Countess Marcian Gregoryi, Jean-Pierre Severin. This fifth anthology of pastiches features some of the most amazing encounters between the legendary heroes and villains of popular literature: Count Dracula and Joséphine Balsamo, Lord Ruthven and the Count of Monte Cristo, the Nyctalope and Ernst Stavro Blofeld, Arsène Lupin and Hanoi Shan, Irma Vep and Fascinax, Monsieur Lecoq and Dr. Loveless... and even Sherlock Holmes and Tevye the Milkman! This anthology of all-new stories, featuring Heroes and Villains from Pulp Literature, edited by JM & Randy Lofficier, combines the talents of renowned authors such as Xavier Maumejean (The League of Heroes), John Peel (Doctor Who, Star Trek), Brian Stableford (Inherit the Earth), Alain le Bussy, with a new generation of gifted storytellers such as Matthew Baugh, Roman Leary, Rick Lai, Micah Harris and David L. Vineyard.